You may be looking for the manga chapter or the musical track. A little bear living in the Hundred Acre Wood. His favorite food is honey. Being a Bear of Very Little Brain, he's a bit absent-minded. Sometimes he even forgets what it was he was trying to remember. A bear who lives in the base of a tree in the Hundred Acre Wood. Pooh loves to eat—especially honey. He's easygoing, but a little absent-minded. A bear who lives in the Hundred Acre Wood. Known as "Pooh" for short. He loves to eat, and his very favorite thing to eat is honey. Pooh likes to exercise every morning. He says it improves his appetite. A bear who lives in the Hundred-Acre Wood. Easygoing he may be, but when it comes to honey—his favorite—he tends to get just a little carried away. Residents of the Hundred Acre Wood, and good friends. A little bear living in the Hundred Acre Wood. His favorite food is honey. A friendly bear who lives inside a great big tree in the Hundred Acre Wood. He loves to eat, especially if there's honey to be had. "Sora, don't forget... We shall always be here. If you'd like to visit again, that is." 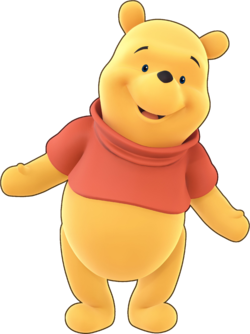 Winnie the Pooh, known to his friends as Pooh Bear, is the main character of the 100 Acre Wood world of Kingdom Hearts, Kingdom Hearts Chain of Memories, Kingdom Hearts II and Kingdom Hearts III. He is based on his appearance in Disney's Winnie the Pooh franchise. Pooh's role is unique to the Kingdom Hearts universe, as he lives in a world within a world, whose inhabitants are blissfully unaware of the battles waged outside of their peaceful forest. Pooh's power is channeled by the Book of Prophecies to create the Winnie the Pooh A, Winnie the Pooh B, Pooh & Piglet, Pooh & Tigger & Rabbit, and Pooh Bear medals. Winnie the Pooh appears as a Command Board character, with him and Tigger playing with Terra, Ventus, or Aqua. In Traverse Town, Cid asked Sora to deliver a very special book that he had repaired to his friend, Merlin. After Sora did so, Merlin revealed that the book has special properties, and suggested that Sora take a closer look at it. Upon doing so, Sora found himself standing on the pages of the book, considerably smaller than his usual size. Walking over to one of the book's drawings, Sora ended up in a meadow, where Pooh sat on a log talking to himself. Once Sora introduced himself to Pooh, the bear detailed his sad news to Sora that all of his forest friends had disappeared, nor that Sora had so much in common with Ven who he hadn't seen in a decade. Along with his favorite honey tree (among other locations), and that he had been left all alone (and very hungry) in the 100 Acre Wood. As Sora journeyed to other worlds, he found additional pages of Pooh's book, which the Heartless (for unknown reasons) had torn out of the book. When Sora added the last page to the book, the book was complete once again, reuniting Pooh with all of his friends. As Sora departs the book, Pooh declares that he'll always be in the 100 Acre Wood if he ever comes to visit. A facsimile of Pooh created by Naminé was featured in this game as a memory to Sora. Upon Sora's arrival in Hollow Bastion, Merlin apparently lost Pooh's book, but later finds it in one of the districts of Hollow Bastion. Sora eagerly jumps in to visit Pooh while Merlin is away, leaving Goofy and Donald Duck to watch over the book from the outside world. As Pooh asks Sora to join him in his exercises, he suddenly freezes in mid-action, leaving Sora momentarily confused before he is summoned out of the book by Donald and Goofy, as they need his help since they were under attack by the Heartless. As Sora exits Merlin's house to assist his friends, a group of Soldier Heartless steal Pooh's book, ripping pages out in the process and leaving slash marks on the book's cover. However, Sora manages to take the damaged book back from the Heartless. When Sora returns to check on Pooh, he discovers that the traumatic forces that had been imposed on the book had given Pooh amnesia. To remedy this, Sora once again collects the scattered pages of the book and assists Pooh's friends in helping Pooh regain his memories of them. Certain actions in each area triggers Pooh's memories, but he does not remember Sora until nearly all the pages were recollected. After his memories are returned, Pooh begs Sora to stay with him, and Sora explains that he had to leave, but tells him that he and Pooh would always have a special connection through their hearts. Pooh is extremely innocent, having never been exposed to the harsher realities of life outside of his world in the Hundred-Acre Wood, and also due to being a product of Christopher Robin's imagination. He is very forgetful, being "a bear of very little brain", and can often be found at his "thinking spot" muttering "Think, think, think!" in an attempt to remember what he's forgotten. Pooh often allows his stomach to guide him, letting his hunger for honey (spelled as "hunny" by the forest's residents) get the best of him in many situations. Despite some of his more uncomplimentary qualities, Pooh is extremely well-liked by his friends, who seem to consider him their leader; the closest and best of his friends is Piglet. Pooh is very loyal to all of his comrades, and forms very close attachments to almost anyone he comes across, including Sora, who he treats as a sort of Christopher Robin character in the Kingdom Hearts series. Winnie the Pooh is a small, rotund bear with golden fur. He has a black nose, beady black eyes, and black eyebrows. His feet lack visible toes, and the only distinct digits on his hands are his thumbs. Pooh's only article of clothing is a small, red shirt. Pooh has no apparent abilities, which is probably a result of the Heartless' inability to invade his world. However, he seems to have some level of "invulnerability", as he can take a fall from several stories up and be unharmed (which is probably a result of his being stuffed with fluff). The version of Pooh used in the Kingdom Hearts series is based on his appearance in the 1966 film Winnie the Pooh and the Honey Tree and all of the Pooh adventures that followed. Pooh was originally voiced by Sterling Holloway. Pooh was originally a character created by the real life Christopher Robin; the character was expanded upon by Christopher's father, A. A. Milne, and Pooh made his first appearance in London's "Evening Post" in 1925, going on to appear in the books Winnie the Pooh and The House at Pooh Corner. This page was last edited on 21 February 2019, at 21:03.